Update: New Heroic Dragon Soul Videos! 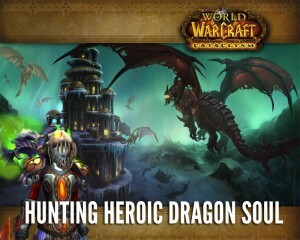 I have just added Hunter POV videos for every fight to my Hunting Heroic Dragon Soul guide! These videos should help clarify any questions regarding fight mechanics or positioning and give you a good idea of what your role in the fight will be if you’re new to the fight as a hunter. Enjoy! I recently read a blog post in which someone was encouraging the macroing of Aspect of the Hawk to almost every shot and then Aspect of the Fox to Cobra Shot and Steady Shot. Here’s the thing about using a crutch like this: if you truly know how to play your class and truly know how to PvP and raid, you can spend an ENTIRE fight in Hawk and never stop DPS. I cannot stress enough how terribly bad form it is to macro aspects to your shots. Do you know how much DPS you lose sitting in Fox for no reason? A lot. Seriously. A lot. I know we don’t stack attack power anymore, but that’s a HUGE loss of DPS. Learning when to switch aspects is akin to knowing how to stutter-step pre-cata. Hunters used to not be able to auto shot while moving. I actually still miss this from time to time. Only some of the time though. But yeah. When you fully know the fight, you can learn when to anticipate movement and do something like spam your focus shot a couple times extra, disengage/strafe while firing instants, pause to cast a focus shot or two, then continue running. All the while, sitting in your high DPS aspect. Back when hunters were mana-based, you had to sit and determine which chunks of the fight you could sit in Viper and not lose too much DPS. This is the same concept. There are very few fights where I could see switching to Fox to be an absolute necessity. And then what about fights like Ultraxion where you literally do not move the entire fight? Imagine how detrimental to your DPS these macros would be. There’s NO reason for you to be in Fox on that fight. Fights like Atramedes, Hodir, Heroic Ragnaros; those fights require heavy movement and there is a legitimate reason to spend parts of the fight in Aspect of the Hawk. But there are still large portions of these fights where you are standing still and will want to be in Aspect of the Hawk. But Zanbon, what about in PvP! Back at the beginning of Cata before hunter aspects got fixed and sitting in Fox wasn’t such a huge loss of damage, I generally just sat in Fox for arenas and most of the time in BGs. But then they buffed Hawk and this is now not really recommended. Swapping aspects or “stance dancing”, if you will, is part of hunter PvP. Hunters have a really high skill cap in PvP and this is just one of the things you have to learn to deal with. In BGs, I like to try and find a “safe” spot to sit and turret in to enemy players and if the melee in my group are doing their jobs right, I generally can. I find myself sitting in Fox a fair amount when I do rated PvP because I tend to be more of a utility rather than a high damage person. I spam tranq things, spam slow things, spam trap, spam a lot. On the rare occasion I’m able to blow all my cooldowns and burst something down, I sure as hell don’t want to waste ANY of my DPS sitting in Fox. Honestly, if you want to macro aspects to your shots, that’s your own choice. But it’s essentially putting training wheels on a tricycle. Get rid of the aspect macros, and ride a big boy/girl bike. One of the most essential techniques you can learn as a hunter is kiting. It’s necessary to your survival while leveling and PvPing, it can salvage a wipe in a dungeon or raid, and it separates the beginners from the pros. There’s a reason hunters are the best kiting class in the game! Jump Shotting is a little more advanced kiting technique, but goes well with a basic kiting tutorial so I decided to include both the basics and advanced fundamentals of kiting in this video. The expansion is rapidly coming to a close and Tier 13 is ending. With the 20% nerf coming out, even more people will be progressing through Dragon Soul. Hunters were all over the place this tier. We started out okay then quickly got nerfed into the ground. They finally fixed us a couple patches in to 4.3 and with good gear and great knowledge of the fights, we are able to go head to head with some of the classes who spend a bit too much time sitting at the top of the meters.